JUNEAU — When Alyse Galvin ran into resistance from some state legislators in a fight over school funding, she didn't give up. She got a loudspeaker. When a budget finally passed two months later, schools were fully funded. One legislator says the persistence of Galvin's organization, Great Alaska Schools, made a difference. It's that tenacity that supporters say will serve Galvin, a familiar face at the Capitol, well if she accomplishes her next goal: election to the U.S. House. The independent is seeking the Democratic nomination and a chance to challenge U.S. Rep. Don Young, a Republican who has held the office for 45 years. If elected, Galvin would be the first woman to hold Alaska's lone House seat. Of her primary opponents, Shein has been the most active, pushing an agenda that includes Medicare for all. He said he's bothered by Galvin's ties to the oil and gas industry: her husband, Pat Galvin, is an executive with Great Bear Petroleum. Galvin said she wants to diversify a state economy that relies largely on oil and see greater investment in renewable energy. She said she supports responsible resource development and that more needs to be done in response to climate change. Both she and her husband, a Democrat who served as state revenue commissioner during then-Gov. Sarah Palin's administration, drive hybrid Priuses. But she's the candidate, she notes — not her husband. "I'm my own person. … Anybody who knows me knows that." In college in California, Galvin trained to be an opera singer but found it "a little bit self-serving," so she switched her focus to political science. Her background includes work in fish processing, managing a hotel and volunteering with Great Alaska Schools. Alison Arians, who worked with Galvin on Great Alaska Schools, said Galvin is the smartest, hardest-working person she has known. "To me, I can't think of somebody who would be more likely to get in there and be able to, I'm not saying change how Congress works, but maybe she could," Arians said. Deena Mitchell, who knows Galvin through their education advocacy, said Galvin listens and has empathy but is also tough and does what she thinks is right. "She can push back when she needs to," Mitchell said. Galvin, 53, said she was frustrated by what sees as a lack of leadership and the ongoing partisan rancor. 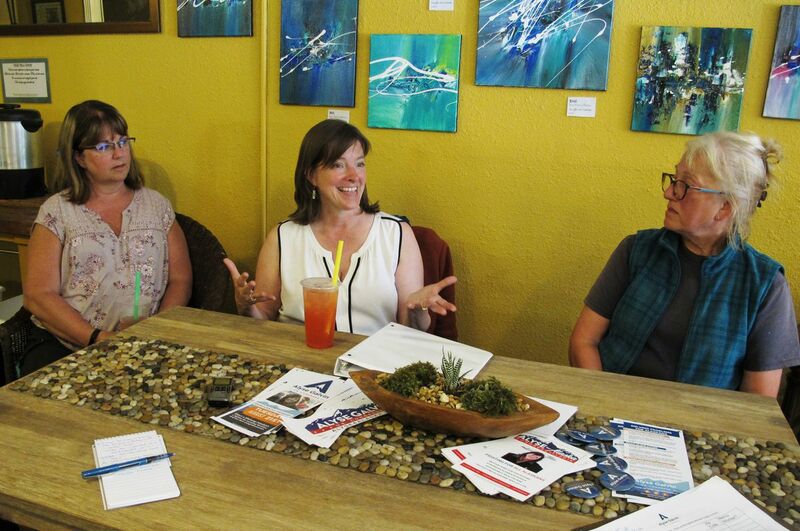 Most registered voters in Alaska identify as independents, and Galvin said she's grateful the Democratic Party opened its primary to give those like her — whose values align closely with the party's — a voice. It's important for people to work together, and that has been missing in Congress, she said. "I am one of those who just believes that we can find common ground enough to get things done," she said. Galvin said she wouldn't take money from corporate political action committees but has accepted contributions from two union PACs, including $4,000 from the NEA Fund for Children and Public Education, the PAC of the major teachers union that endorsed her. She said she respects Young's service, but it's time for new energy. Young, 85, recently referred to cellphones as "the worst thing that God ever gave man." His spokeswoman says that's a reference to how phones can be distracting and says Young thinks traveling the state and speaking with people one-on-one is the best form of communication. In one Facebook video last month, Galvin recorded herself calling Young's office to lament his lack of response to President Donald Trump's summit with Russian President Vladimir Putin, which both Alaska's U.S. senators weighed in on. Associated Press reporter Mark Thiessen contributed to this report from Anchorage.